The new Farr 400 is all predator, a no-holds-barred one design that can ghost through 5-knot holes and still stand tall in 25-knot gusts. As the heir apparent to the Farr 40, this all-carbon lightweight speedster reveals an up-tick in commitment to performance and an upgrade in the commitment to technology. Bruce Farr calls his latest vision a “refined one design,” a boat that sheds compromise in order to focus on the job at hand. And the tasks he’s referring to include dramatic upwind sailing and quick-to-plane off the wind action. From a design point of view, there’s a threefold amalgam in play: a low-drag hull shape with a lean flattened canoe body that’s more surfboard than sailboat; foils that are tuned to excellent performance on all points of sail; and a rig, sail plan and deck layout that takes lessons learned from the GP 42 and the TP 52 and parlays them into an even more ergonomic design. In short, it’s a finely honed racer that behaves like a well tuned musical instrument. As important as what the Farr 400 design incorporates is what it has shed, and the first of these “sacrifices” is extraneous weight and windage. Some may view the low freeboard and reverse sheer line as a little extreme, but it’s another logic-based design decision. Why carry more weight and windage than necessary? 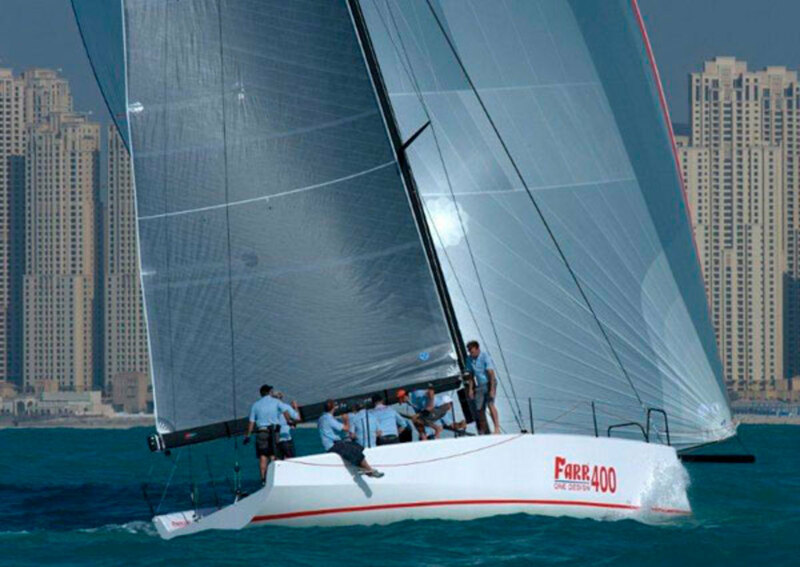 Farr and associates intentionally created a Category B offshore racer, not an ocean-crossing Category A platform in the interest of engineering a more single-purpose race boat. Concerns such as how to mitigate the effects of trough diving in 20 foot seas didn’t have to drive the equation. Nor was there a need to stick a faux cruise boat interior into what’s essentially a full-cabin sail bin. Yes, there are pipe berths triced up port and starboard, a stove, mini sink, toilet and room for a substantial cooler. But even Spartan minimalists would underrate the 400’s role as a comfy cruiser. The concerted effort to save weight via an aviation approach to composite engineering makes sense, as does the design team’s quest to keep the vertical center of gravity as low as possible though weight savings aloft, rather than simply casting a bigger bulb. The resulting 59 percent ballast ratio adds an impressive secondary righting moment that’s reassuring during on-the-edge encounters. The new Farr 400 is a major leap forward in boatbuilding that’s technically closer to what’s coming out the doors of Boeing’s composite shop than what we see from most production shops. The all carbon and epoxy hull is comprised of an SP/High Modulus resin infused sandwich structure with a carefully engineered grid that’s bonded and tabbed in place. The structure adds fore and aft and transverse stiffness in addition to picking up and spreading rig and keel loads. Finite element analysis has been used to define the high load hot spots and extra reinforcement has been placed where it’s most needed. The attention to detail lavished on the project during the composite fabrication process shows up in all of the interior nooks and crannies. Small but vital features such as how carbon chainplates have been fabricated and bonded to the hull are further testimony to top tier craftsmanship as is the uniformly tapered and exquisitely bonded hull-to-deck joint. 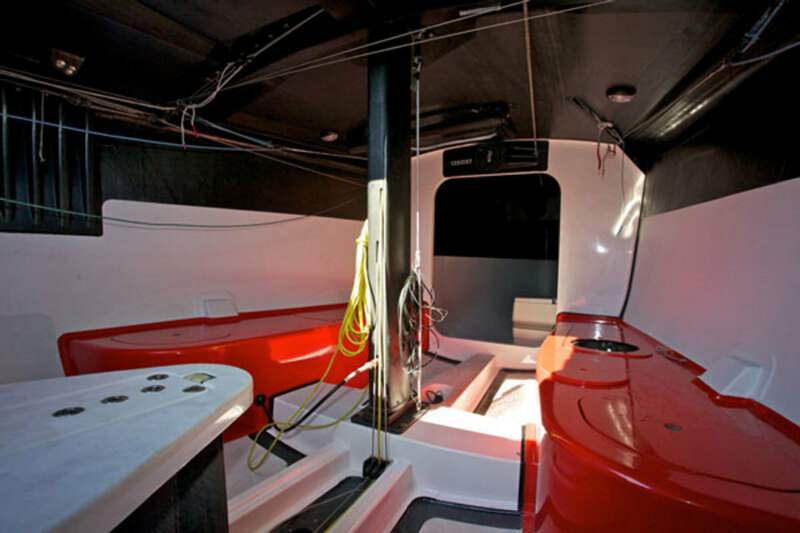 Premier Composite Technology LLC, the Dubai based builder of the Farr 400, gets a solid A for superior workmanship. The appendages have seen as much of a technological upgrade as the hull itself. A two piece prepreg carbon fiber rig from Southern Spars teams up with C-6 carbon fiber standing rigging to create a light, durable alternative to the aluminum billet and stainless tradition that held sway for decades. The double-spreader rig has a 22 degree sweepback, and the boat’s ability to bring the breeze forward eliminates deep reaches and runs that can jam spreader tips into the mainsail. The high modulus ferrous metal keel foil is sheathed with an FRP skin and carefully faired. The lead bulb forms an inverted T-shaped terminus at the end of the keel foil, while Jefa bearings provide a smooth articulating surface for the carbon fiber rudder stock. The keel, rig and rudder live up to the same close-tolerance, high-tech standards seen throughout the boat. Even the Dyneema lifelines and carbon-fiber stanchions fall into this cutting edge composites theme. The easy to remove keel and rudder and two-part mast really pay off when it comes time to box up the boat and head down I-95 on a trailer sprint to Key West. 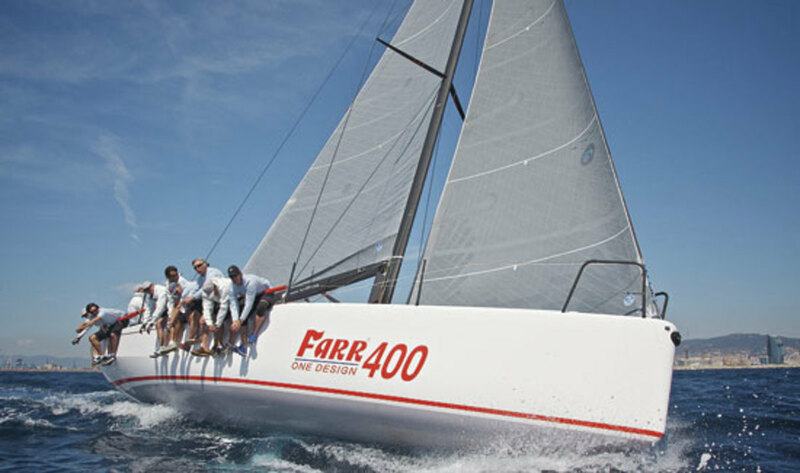 The Farr 400 and its cradle have also been engineered so that the hull can be tilted to about 80 degrees and fit in the same footprint as a conventional 40-foot container. This is a big plus when it comes to shipping the boat to an overseas regatta. First impressions are often lasting ones, and when I stepped aboard the Farr 400 nothing seemed out of place. Designed with a crew of eight in mind, Farr Yacht Design has refined the grand prix deck layout spreading out tasks and hardware in an effort to expedite sail trim, boat handling and overall efficiency. Hardware billing went to Lewmar and Spinlock, and the blocks, winches, clutches, tracks and leads all follow a keep–it-simple theme that emphasizes user friendliness. Each major piece of hardware is large enough to handle the loads imposed, yet small enough to add as little weigh as possible. This pas de dux is a tough balance, especially when picking hardware capable of handling a wide wind range. The asymmetric halyard and deck layout contributes to the mission, but off centerline hatches can be an issue in a deep knockdown. Once again the Farr team met one design challenge with another example of solid engineering. In this case the boat’s high ballast ratio and powerful secondary righting moment reduces the risk of a mast-dousing knock down that could lead to a down flooding problem caused by an offset hatch. The boat’s wide beam is carried aft and a large open-transom cockpit expands the playing field. It also allows for room to take care of sail handling and trimming task without the crew elbowing each other due to awkward winch placement. A good example of this form and function partnership can be found in the way the deck has been set up for the backstay handler. Twin backstays bookend the square-headed mainsail, and each leads to its own canted self-tailer aft of the helm. The added space gives the backstay handler more room to work and a more efficient angle at which to make those vital runner swaps. The layout also provides helmsmen with the choice of either a windward or leeward perch regardless of whether the boat is steered with twin wheels or a tiller. Trimmers love the carbon fiber primaries powered by a pedestal situated on the centerline near the forward end of the cockpit. Versatile line leads allow it to be used for conventional headsail sheeting, mainsail hoisting, and even raising the drop keel, so that the performance enhancing nine and a half foot draft turns into a marina friendly draft of about six and a half feet. The real fun lies in going for a ride in a sailboat that can outwit the wind. Our first light air test sail in flat water conditions near Annapolis, led to a few stints of the knotmeter exceeding the anemometer’s true wind readings. It’s clear that the new boat is agile and responsive. Sail designer Dave Flynn and the local Quantum loft crew had been fine tuning the Farr 400 and little things like outboard and inboard sheeting options made sense. The sails were all esoteric biased laminates—in keeping with the boat’s prepreg carbon spars, high modulus fiber standing rigging and Formula One racecar like hull laminate. The sum total of this commitment to technology paid off in the light air. The first hard to ignore fact of life was how effectively the boat brought the apparent wind forward. The delta between true and apparent wind direction displayed on the instruments was impressive, and as a 5-knot true wind felt like a 10-knot gust, the acceleration was ballistic. The twin wheel helm had little drag, almost a neutral helm in the light conditions, and I’m sure that steering would be equally facile aboard the tiller-steered version. Tacking was crisp and efficient, and while the pedestal driven primaries seemed like overkill in the light air, the grinder earns his keep when the wind fills in. Off the wind, the slightly down-swept centerline carbon sprit is the right tool for the job at hand. It projects the tack of the asymmetric spinnaker just far enough forward to be in clean air and afford a cloud full of sail area. Leads are versatile enough to use either the multipurpose winch or the pedestal-driven primary for spinnaker needs. The jibes can get exciting, but good helm control and trimmer timing gets the sail from side to side with little drama. A few days after our light air sail, I had a chance to chase after the Farr 400 in a RIB, and a good part of the time we were both on a plane. The breeze was a steady 18-20 knots, and although the crew had its hands full, the smiles all around said a lot about the experience. The boat was stiff, pointed high and the crew seemed comfortable hiking against the padding on the lower dyneema lifeline. I was most impressed by how well the deck layout contributed to the top mark transition from beating to reaching, and how quickly and effortless the asym to jib change unfolded at the bottom mark. This new tricked-out one design has been initially tagged with a reasonable ORC 526 GPH and what some would call a punishing IRC 1.248. But with 13 boats already sailing at press time, a one design future seems to be in the cards. The Farr 400 is built for speed, but it’s also built to make the boat handling as user friendly as possible. The two add up to an A-plus rating overall and a fun factor that is off the charts.